PHUKET CITY: Residents with respiratory ailments can protect themselves from the smoke that has enveloped the island by picking up free face masks at Wachira Phuket Hospital. Dr Wanchai Sattayawutthipong, Chief of the Phuket Provincial Public Health Office (PPHO), told the Gazette that the average particulate matter reading (PM-10 reading, for particles less than 10 microns in size) in air samples taken over 24 hours yesterday was 82.5 micrograms per cubic meter, still well below the 120µg/m³threshold deemed to pose a risk to healthy people. Dr Wanchai said the smoke could pose a threat to people with allergies and respiratory illnesses. 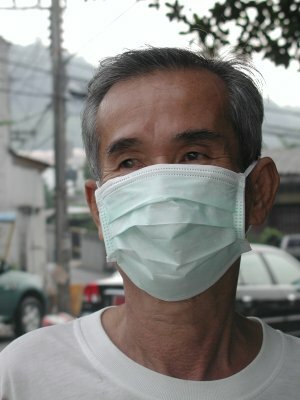 Such people could collect face masks free-of-charge at Wachira Phuket Hospital, he said. The source of the haze is wildfires burning out of control on the Indonesian island of Sumatra, he said. -Do not collect rainwater for drinking until at least one hour has passed since the beginning of the rainfall. The most recent readings show a PM-10 reading of 69.8 µg/m³ and an Air Quality Index (AQI) of 69, also below the warning standard of 100. For more information please contact the PPHO at 076-222913-4.